Among the most memorable of the infomercial real estate gurus were brothers John and Greg Rice, who for years promoted their Cash Flow Generator workshops on TV. What made these two stand out was that they were not only identical twins but also dwarfs. In fact, the 2 foot, 10 inch pair were in the Guinness Book of World Records as the shortest living identical twins. As you can see from the video, the Rice brothers were even less shy than Tom Vu in admitting that other people’s bad fortune could be a great boon for your real estate portfolio. According to the Classic TV Archive, the short-lived “Foul Play” series aired six episodes between January and August of 1981. Watch this clip of the opening credits from Foul Play, and sure enough John and Greg Rice appear near the end. 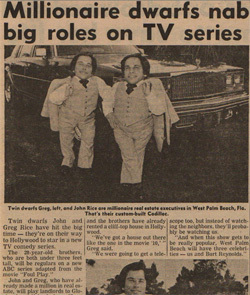 And check out these photos of the Rice brothers from the TV show. I would bet Trey and Matt had those guys in mind when they did that episode.